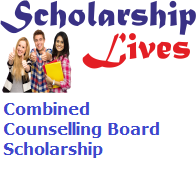 The team members of the Combined Counselling Board (CCB) are going to update the Combined Counselling Board Scholarship 2019 for all those students who are studying in class 10th, 12th, and graduation. The main objective of the board is to provide financial aid to students to complete their education. If you are also one of them whose profile match with the eligibility criteria they don’t miss this golden opportunity and fill the Combined Counselling Board Scholarship Application form 2019 before the last date through the link which is mention below. Students can get 100 % scholarship of the course Fee. Under this scholarship Scheme students can get award up to Rs 1 lakh to 4 lakh depending upon the course they want chose. Students Must have passed 10th, 12th & graduation can eligible in this scholarship from all regions of India. They should have passed their last exam by mini. 33 % to 50 % marks. 10th, 12th or Graduation mark Sheet. Student must have Bank Account number & detailed account information. Steps to check the Combined Counselling Board Scholarship. Apply Online & Take the printout of Application Receipt/Counselling Letter. Take the printout of Allotment Letter of your choice college from CCB and talk to your college director (contact number is given in the Allotment Letter).